Posted by Jenny in history, travel. In this series of posts, we journey on the Lincoln Highway from New York City to San Francisco, taking it state by state. Go here for an introduction. In my last post about the Lincoln Highway, I talked about the early history of the Highway in Wyoming as well as a bit of my personal history in the state. This post tours a few of the highlights that can be seen along the route today. Entering the state from Kimball, Nebraska—and as usual in the West following the route of the Union Pacific Railroad—the Highway soon passes through the state capital of Cheyenne. Points of interest along 16th Street (the Highway’s route) include not only the Lincoln Theater shown above but the Atlas Theater. 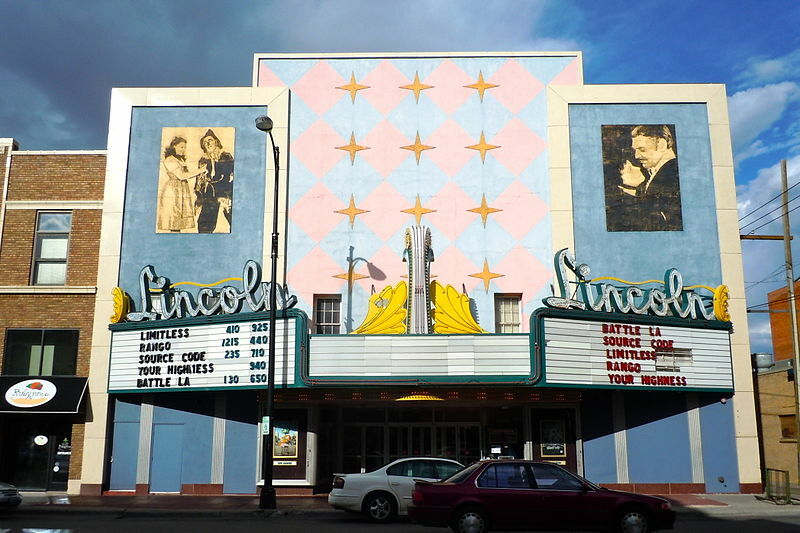 The Lincoln Theater was built in 1913, or the same year that the route of the Lincoln Highway was mapped out. It must have been a welcome stopping point for travelers braving the primitive roadway of the early Lincoln days. To this day it boasts the original fittings: a big chandelier and balcony seating. It operates today as a second-run movie theater, but with bargain ticket prices of $2.00. The Atlas down the street, built in 1888, has gone through many transformations. It was constructed as an office building with a tea room (now, there’s a pleasantly obsolete concept!). 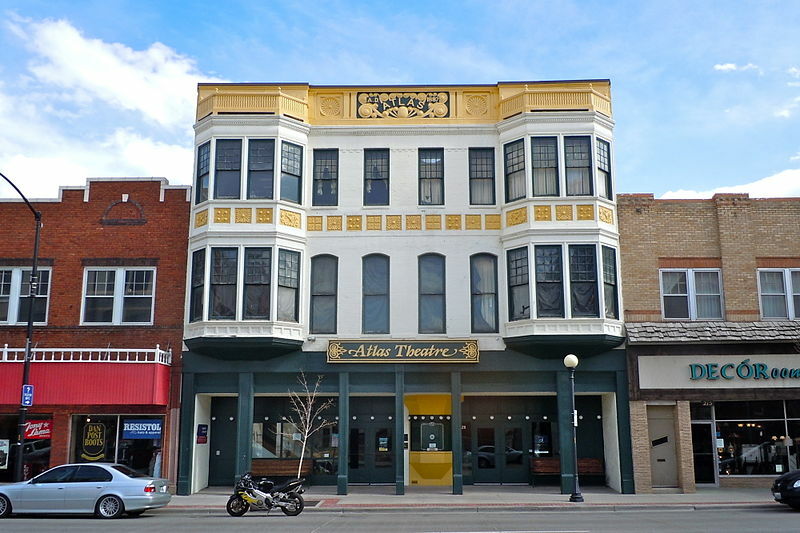 It was converted to a stage theater in 1908, designed for use by traveling companies, complete with soda fountain, a penny arcade, and a confectionery parlor. It fell upon hard times in the 1920s, becoming a rooming house and then a movie theater called the Strand. The touring drama troupes had faded from existence, replaced by the moving pictures and by the popularity of radio. The Pink Pony Nightclub succeeded the Strand. But now, the longstanding Cheyenne Little Theatre Players use the space for their “Old Fashioned Melodrama” and other productions. Like many other historic structures along the Highway, it is in urgent need of funds for renovation. 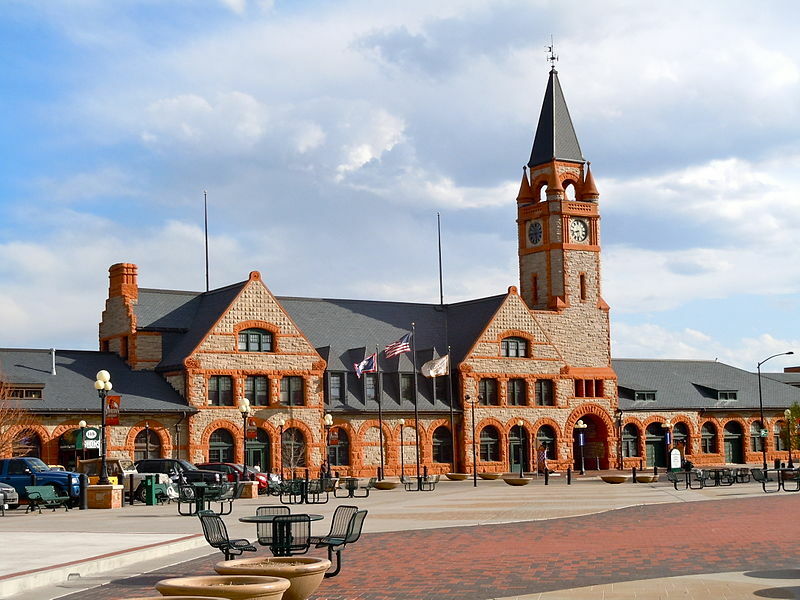 Also in Cheyenne, the Union Pacific Railroad Depot fronts the Highway route. It is a lovely structure, complete with Romanesque arches and an imposing clock tower. West of Cheyenne, as we follow I-80—which occupies the Highway route for the majority of mileage across the state—it is possible to stop and view the Tree in the Rock, a small limber pine that seemingly grows out of solid rock. It is said that locomotive firemen on the UP stopped here to give the tree a spritz of water from their buckets. However, the route of the railroad shifted several miles south in 1901. The Tree in the Rock is located near Buford, an unincorporated community with a population of one. In the late 1800s when the railroad was under construction, it was a thriving community. 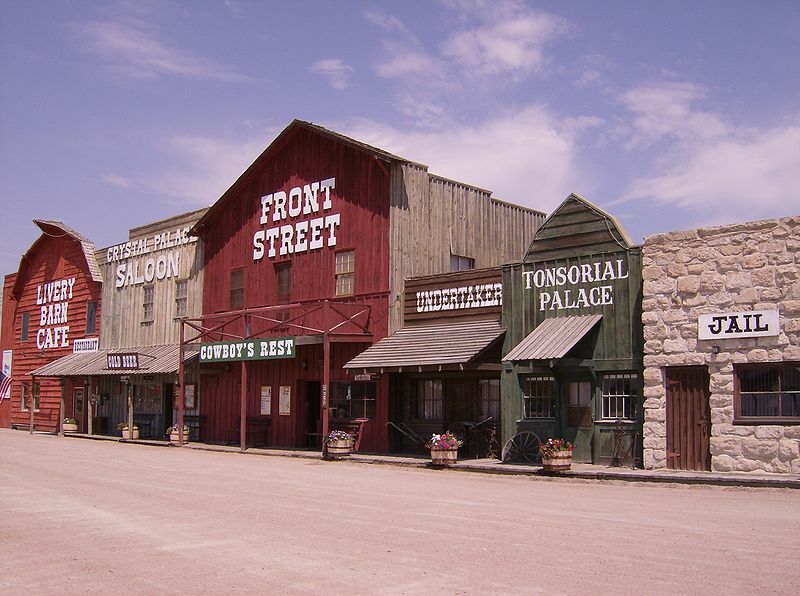 The town, with its trading post, is currently for sale, following the mayor’s decision to retire. The Ames Monument at Exit 329 off I-80 commemorates Oliver and Oakes Ames, the primary financiers of the UP. It looks Egyptian to me. 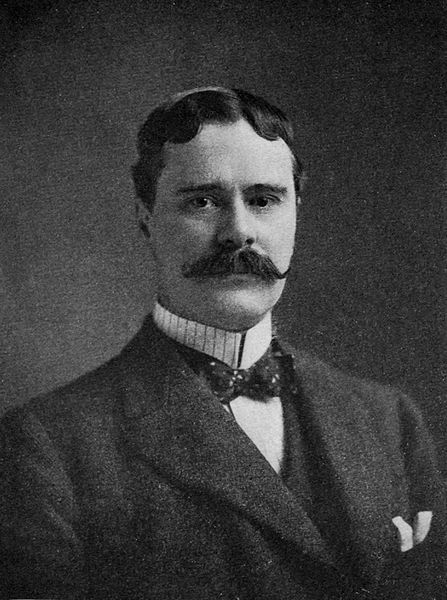 Oakes, a U.S. representative in Massachusetts, was implicated in fraud and censured by Congress. 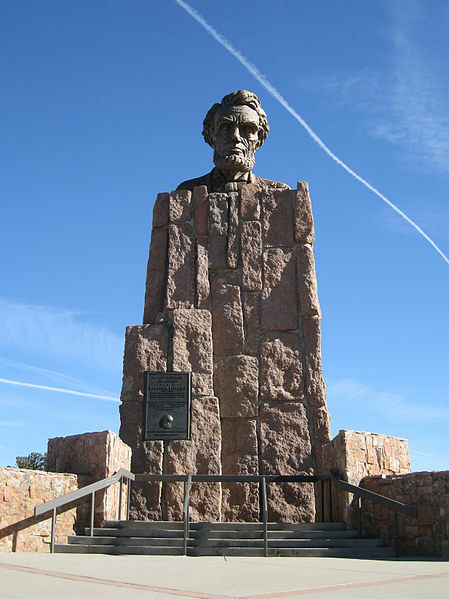 A bit further along, at the I-80 Summit Rest Area, we encounter a gigantic bust of Lincoln. Formerly located at the highest point on the transcontinental railroad (8,247′), it was shifted a short distance when I-80 came through. University of Wyoming art professor Robert Russin sculpted the bust. It’s amazing how many different styles have been used to depict Abraham Lincoln in sculpture. Beside the Lincoln sculpture stands a memorial to Henry B. Joy (1864-1936), first president of the Lincoln Highway Association and also president of the Packard Motor Company. At Laramie, I-80 and US 30 diverge, the route of the Highway being aligned with US 30. So a traveler of today seeking to follow the Highway makes an arc to the northwest away from the interstate and rejoins it at Walcott. A point of interest along this stretch is Como Bluff, where many dinosaur skeletons were discovered in the late 1800s. A cabin was constructed entirely of dinosaur bones. In Medicine Bow, it’s possible to stay at the Virginian Hotel. 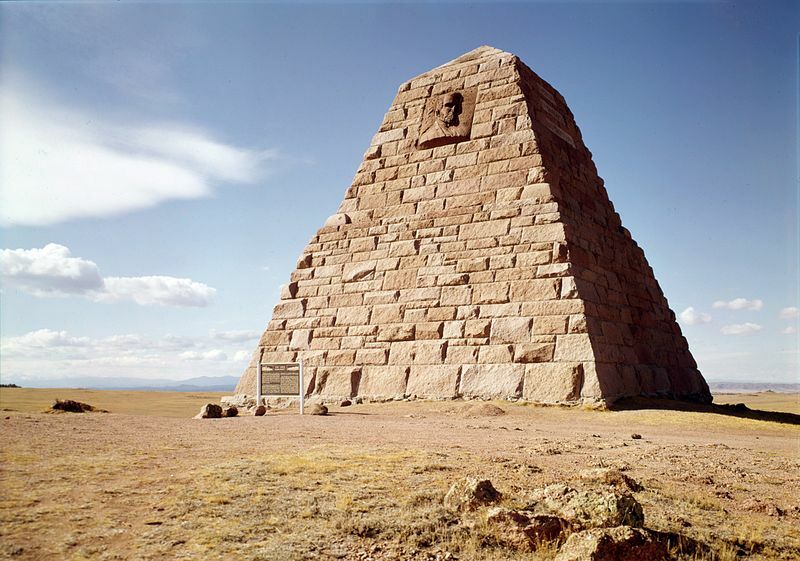 It was built in the early days of the Highway and named for the novel by Owen Wister, who visited Medicine Bow in the 1880s and used it as the setting for his book. The Virginian is generally considered the first cowboy novel and has all the right ingredients: a stern protagonist with a gentle side, a pretty schoolteacher, and cattle rustlers. Current Trip Advisor reports for the hotel give it high points for atmosphere and low points for the trains passing close by all through the night. After picking up I-80 again, the route arrives at Rawlins, site of the Wyoming Frontier Prison and now a tourist attraction. It opened in 1901 and had no electricity or running water, and heating was inadequate. Overcrowding was a constant problem. It featured a dungeon and a “punishment pole” to which men were handcuffed and beaten with rubber hoses, a practice finally eliminated in 1930. Prisoners receiving a death sentence were executed by hanging until a gas chamber was installed in 1936. The prison ceased operations in 1981. The prison website features profiles of selected inmates. 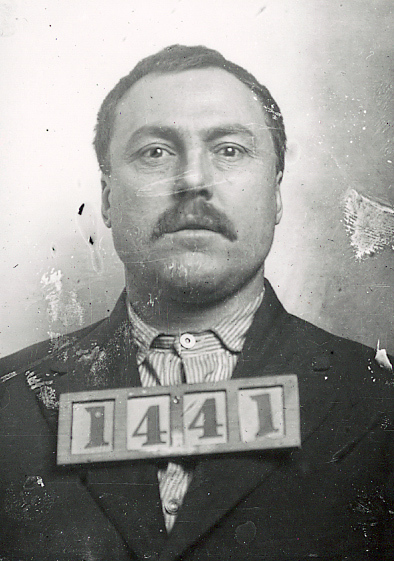 George Sabin, pictured below, was imprisoned for second degree murder in 1909. He was the leader of a group of cattle men who killed three sheep men after they brought a herd of 50,000 sheep into a valley that had been claimed by the cattle interests. Once in prison, Sabin started a baseball team, but the team’s fortunes declined after the catcher was hanged. Sabin escaped when working on a road gang because the guard allowed him to wander about a nearby town with money in his pockets. 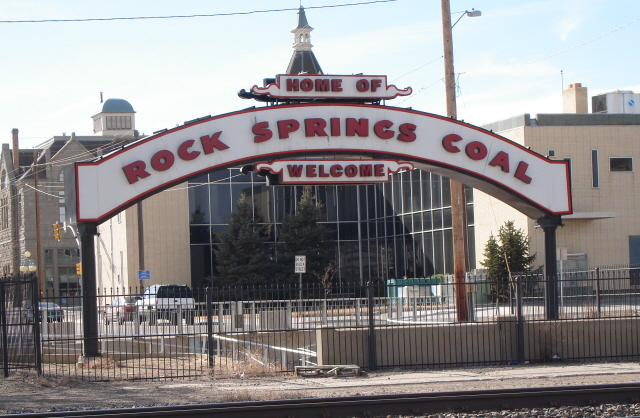 At Rock Springs, an arch formerly straddled the Highway. It now stands adjacent to the UP depot. We arrive at the town of Green River and the crossing of the river itself. 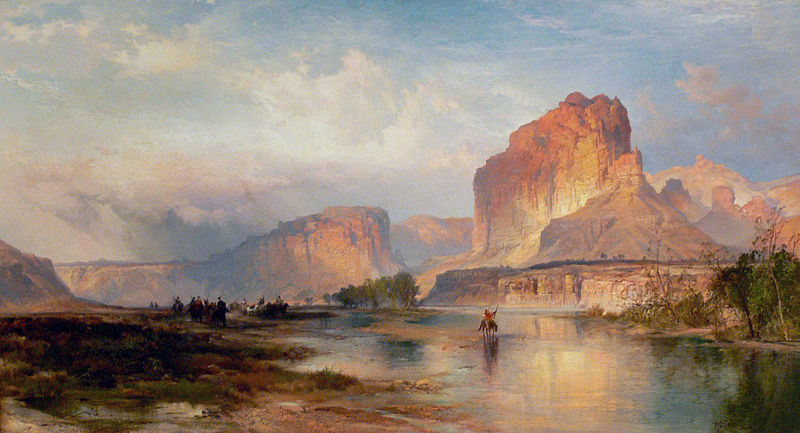 The area was depicted by Thomas Moran, who is considered to belong to the “Rocky Mountain School” of landscape painters, also including Albert Bierstadt, Thomas Hill, and William Keith. He had been born in England, and the western landscapes seem to have made a big impression on him. It was near the town of Green River that John Wesley Powell launched his nine-man expedition down the Green and Colorado Rivers, a hazardous journey that took three months. 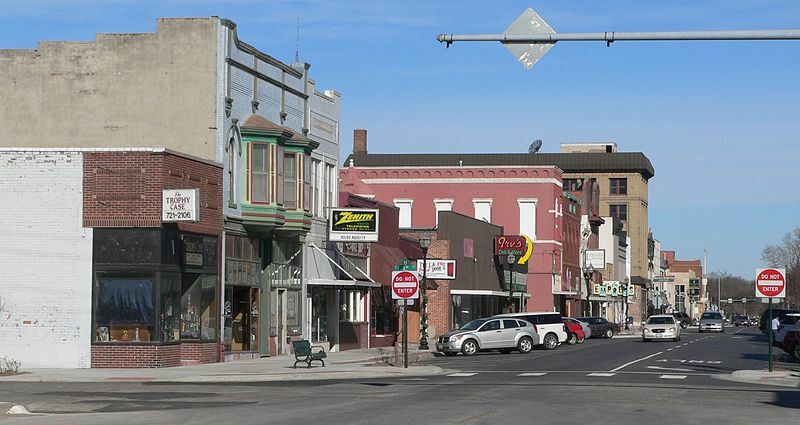 The last stop in Wyoming is Evanston, which developed as a railroad and mining town. James Cash Penney ran the Golden Rule Store here before moving to Kemmerer and opening the first of the stores named for him. The town was also known for its large population of Chinese laborers, but the Chinese had left town by the 1930s. I lived in Casper, Wyoming, for most of the school year when I was 16 years old, and I have a peculiar fondness for the state even though many of my memories concern howling winds, blowing tumbleweeds, and vast empty spaces. I’ll always remember venturing out onto the lonely highway with my high school driving instructor, who said, “Go as close to the speed limit as you feel comfortable.” The speed limit was 85. 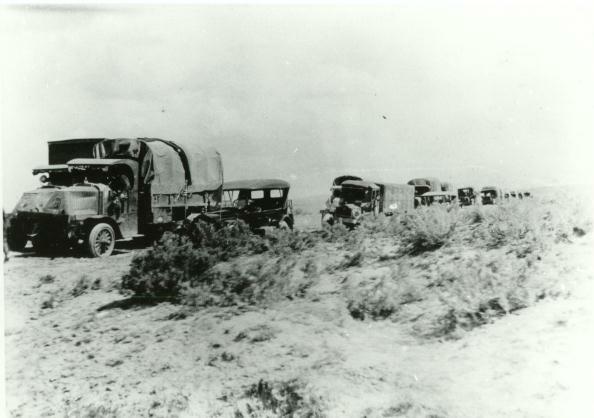 The Lincoln Highway took a more southerly route, through Cheyenne and Laramie. Most of its path through the state is now occupied by I-80, although the route arcs northwest from Laramie where US 30 departs from I-80, rejoining it past Medicine Bow. US 30 is the route of the Highway from Philadelphia all the way into West Wendover, Nevada, although there are many small deviations, and interstates replace the US highway for some of the mileage. My cousin Corinne Lively, who grew up in Casper, called my attention to an excellent description of driving in Wyoming in the early days. At times motorists were obliged to drive across railroad bridges, and navigation was difficult. 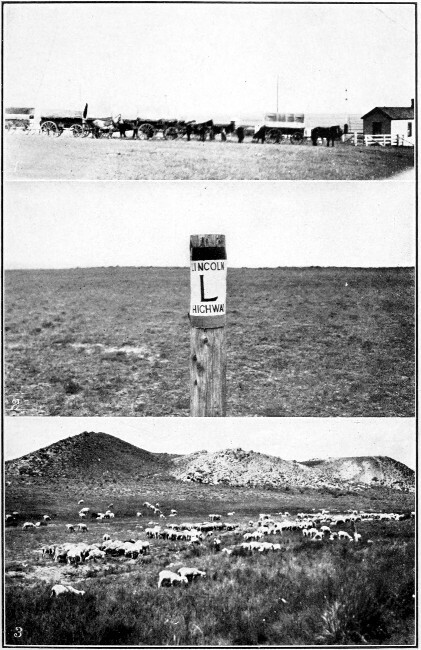 An early motorist, Alice Ramsey, recalled, Across Wyoming the roads threaded through privately owned cattle ranches. My companions were obliged to take turns opening and closing the gates of the fences which surrounded them as we drove through. If we got lost we’d take to the high ground and search the horizon for the nearest telephone poles with the most wires. 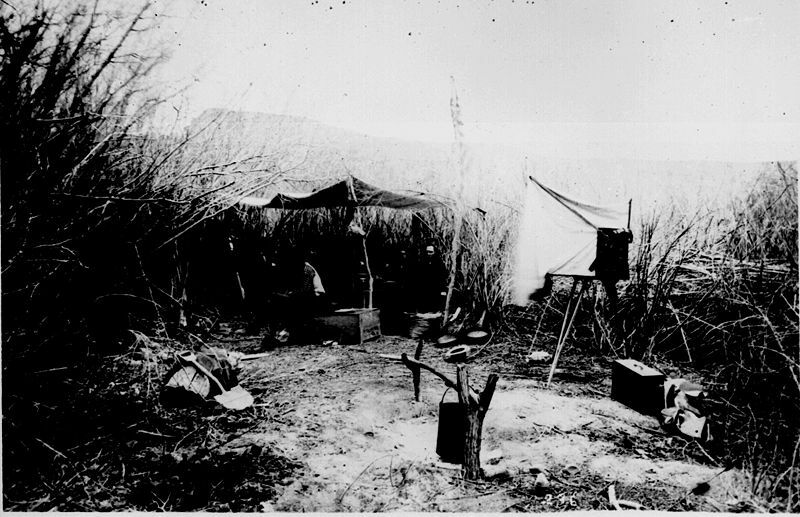 It was a sure way of locating the transcontinental railroad which we knew would lead us back to civilization. At the little town of Granger on the railroad line we met two young pedestrians who were walking on a wager from Kearney, Nebraska, to Seattle. They were to have $500 apiece if they reached Seattle by the first of August. Their yellow outing shirts bore the inscription, “Walking from Kearney, Nebraska, to Seattle.” They told us they were able to make forty miles a day. When they reached Salt Lake City they were to have substantial new walking boots from the merchants at Kearney, the bargain being that at that point they were to return their worn boots to be exhibited in the shop windows of Kearney. The road from Point of Rocks to Wamsutter is very rough and we were tormented by the plague of these roads of the plains; namely, gutters made across the roadway by running water in times of freshets. One has to be continually on guard for these runnels…. They give the machine a frightful jar and if one comes upon them suddenly they are likely to break an axle…. As we drive along, we constantly see the remains of former camps by the roadside. Old tin teakettles, pieces of worn-out campstools, piles of tin cans…. We pass the dried-up carcasses of sheep and the bones of cattle and of horses as they lie upon the desert near the road. Ahhh… now we are truly getting into the West, where we might see antelope or prairie dogs, where the sky keeps getting larger and the air has a tang of dryness. The current highway map of Nebraska shows some nice shapes. I-80 is the dominant line across the state, taking the lovely yin-yang curve of the Platte River for much of its length before it leaves the river and straightens into a purposeful line in the more rectilinear patterns of eastern Nebraska. The split of I-80 and US 26 at Ogallala reflects the widening separation of the North Platte and the South Platte. We notice that certain counties in western Nebraska have practically no roads in them. The route of the Lincoln Highway follows US 30 all the way across, which in turn follows the curves of the Platte. Where I-80 tracks the Platte, US 30 runs like a shadow just north of it. There is just one significant exception: the original 1913 route entered Nebraska from Iowa slightly further south, going through Omaha because that’s where the bridge over the Missouri was located. It then headed northwest to hit Fremont. After a bridge was built at Blair in 1929, the Highway was routed that way for a more direct connection westward from Iowa. In fact, another early named highway made that connection through Blair, the “Bee-Line,” but although highway construction started in 1923, the route didn’t get much traffic until the bridge went into place. The old and new routes joined in Fremont. Continuing west, we reach Columbus, which has some interesting attractions, including Glur’s Tavern. Glur’s (I love that name) is said to be the oldest bar west of the Missouri operating continuously in the same building. It opened in 1876 as Bucher’s Saloon, and there is still a “Saloon” sign over the door. The Glurs bought the place in 1914. It features old photographs on the wall and ancient wooden floorboards. Columbus also boasts the Lincoln Highway Garage, built in 1915 to handle any malfunctioning vehicles making the grand journey along the Highway. It has an imposing appearance, and the word “GARAGE” is etched in the formal lettering style you might expect on a tombstone. 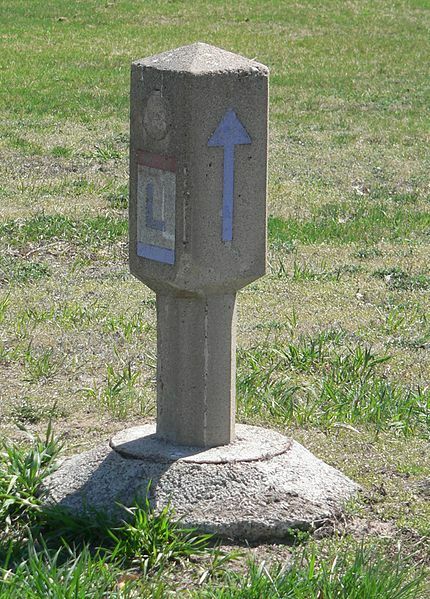 The Highway passes through the small town of Duncan, where a marker can be seen. The marker is located at the end of a 2.4-mile section that is largely unchanged from the 1920s, a road lined with hackberry trees. 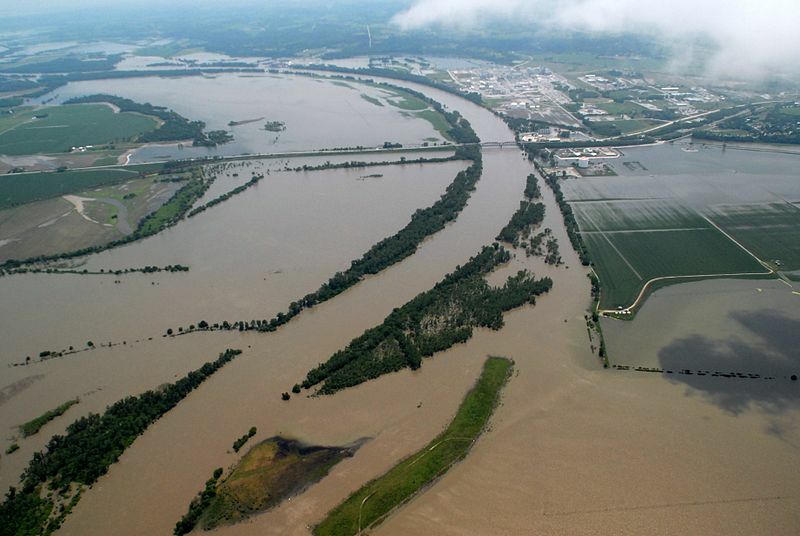 At Grand Island, I-80 comes in from the east to join US 30 in its following of the Platte. Grand Island has one of those very elegant county courthouses that we have noted all along the way. It was built 1901. 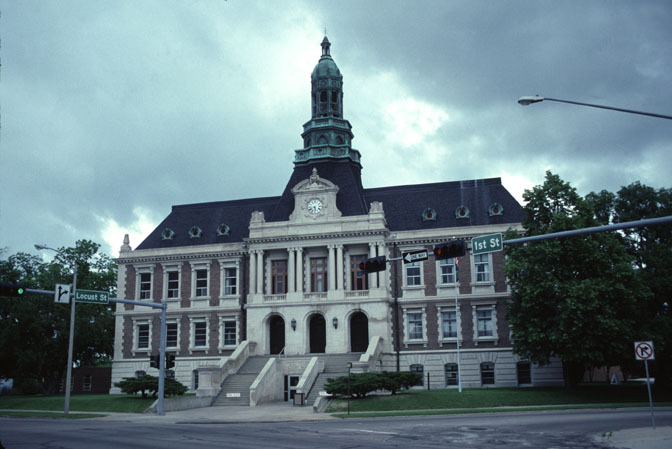 The courthouse survived the famous Grand Island Tornadoes of 1980. Several features made this event a meteorological freak. It was a slow-moving supercell complex that moved across town at only 8 mph, and most of them looped around to recross places they had already devastated—I can only dimly imagine the horrific experience of the residents. 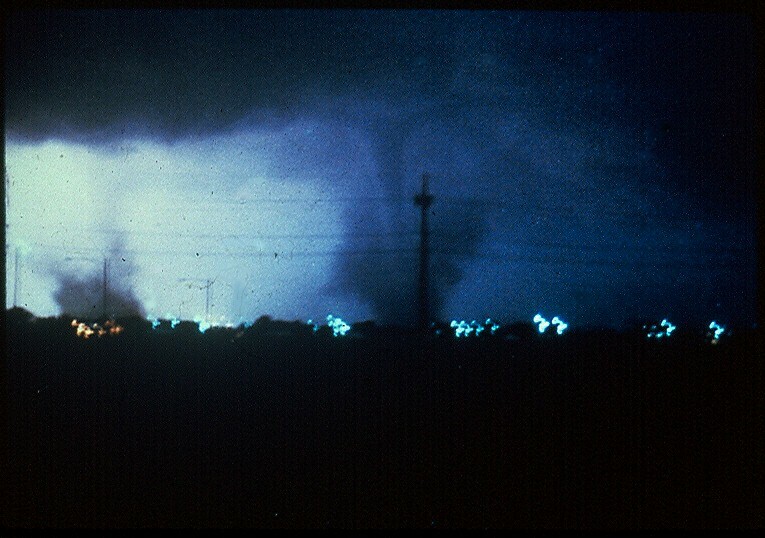 Three of the tornadoes were anticyclonic, meaning they spun clockwise rather than counterclockwise as is usually the case in the Northern Hemisphere: cyclones generally follow the Coriolis Effect, which causes water to spin down the bathtub drain in opposite directions in the two hemispheres. Two tornadoes are visible in this picture from Grand Island. The Highway passes through Kearney, which can be seen in this panorama from 1909. In Lexington, it is possible to visit the Heartland Museum of Military Vehicles. What’s really interesting about the museum’s collection of tanks, ambulances, snow tractors, and other vehicles is that most were acquired within a 150-mile radius of Lexington, according to the museum website. They were used in the 1940s and 1950s for farming purposes when tractors were in short supply, then as time went on were generally left idle somewhere on the property. The collection of vehicles was started by four men in 1986 in part so that veterans would have a chance to visit and enjoy them. The museum has restored them, and many are operational. 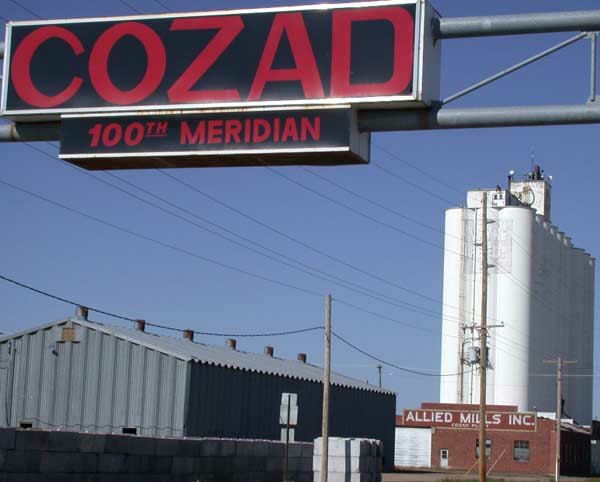 Now we come to Cozad, which sits astride the 100th meridian (see photo at top). It is also known as the place where artist Robert Henri (born Robert Henry Cozad) lived during his childhood. 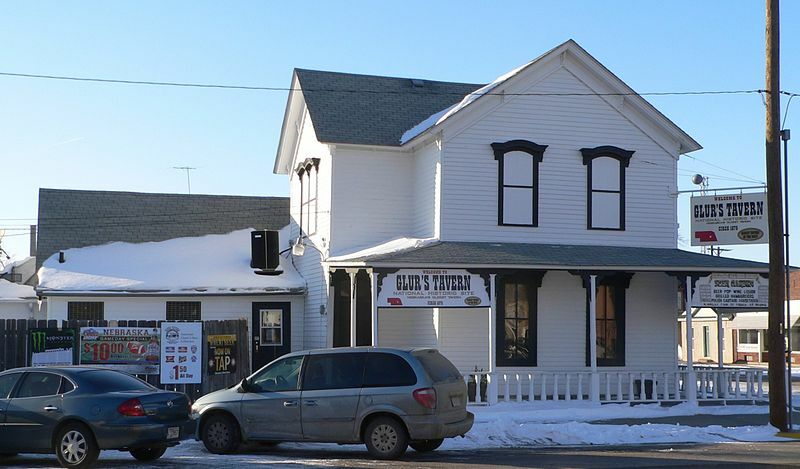 The town was founded by his father, John Jackson Cozad, a gambler and real estate developer who also founded Cozaddale, Ohio, thus sprinkling that strange-sounding name across the country. 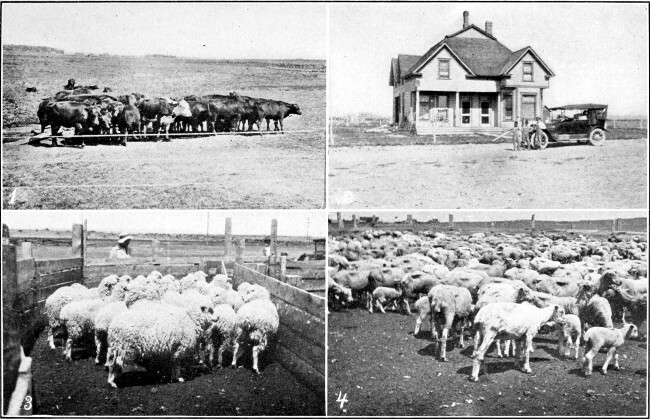 In 1882, John Cozad fatally shot a local rancher over a cattle grazing dispute. Apparently he was cleared—it must have been considered an act of self-defense—but the townspeople turned against the Cozad family, which fled to Denver. They all changed their names and continued moving from place to place across the country, ending in Atlantic City, New Jersey, where the now-styled Robert Henri started his successful career painting Parisian-looking scenes of urban landscapes and portraits of refined people. Quite an act of self-invention! The town never changed its name and now even features a Robert Henri museum. The Highway passes through Gothenburg, which like much of the route through Nebraska, was along the route of the Pony Express. A station from the Express can be visited there. West of Ogallala, US 30, I-80 (and the Highway) go straight west toward Sidney and Kimball, while I-76 picks up the route of the South Platte toward Colorado, a state that lobbied hard to be included along the Lincoln Highway but was ultimately not made part of the route. Out toward the Wyoming border, we reach Kimball, which calls itself the “High Point of Nebraska” because the state high point, Panorama Point (5,424′) is located not far away. In fact, another Nebraska town is actually the elevational high point at its town center (4,876′). 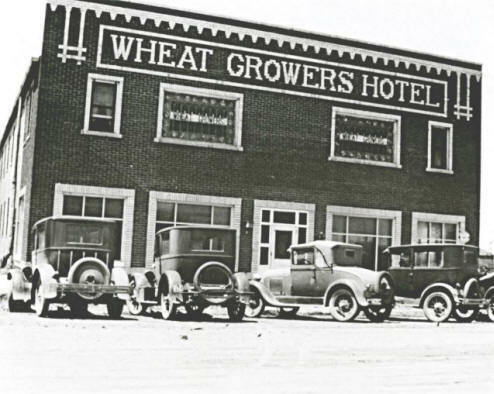 Kimball is the location of the historic Wheat Growers Hotel, opened in an elegant ceremony in 1918. It is an imposing brick edifice with the words WHEAT GROWERS HOTEL blazoned across its front. It had days of glory when the ballroom was often in use and notable people stayed there, including the young Eisenhower during his 1919 Transcontinental Military Convoy. 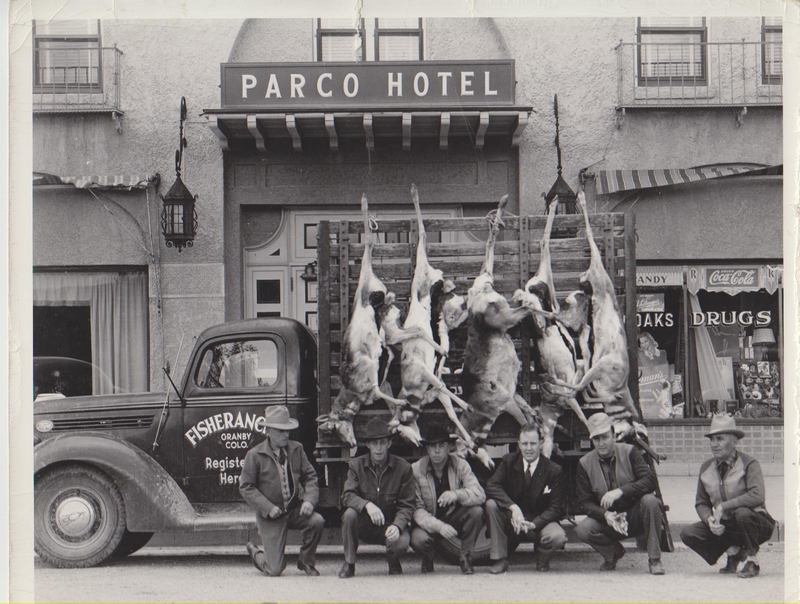 The hotel fell upon hard times in the mid 1920s, but managed to survive the Great Depression and the Dust Bowl. Yet time took its toll, and the aging facility closed in 1988. Citizens of Kimball have been engaged in a dedicated effort to preserve and restore this “grand old lady.” You can buy the hotel and fix it up if you like, and in so doing make an enormous contribution to the region. For further information, check out this website. 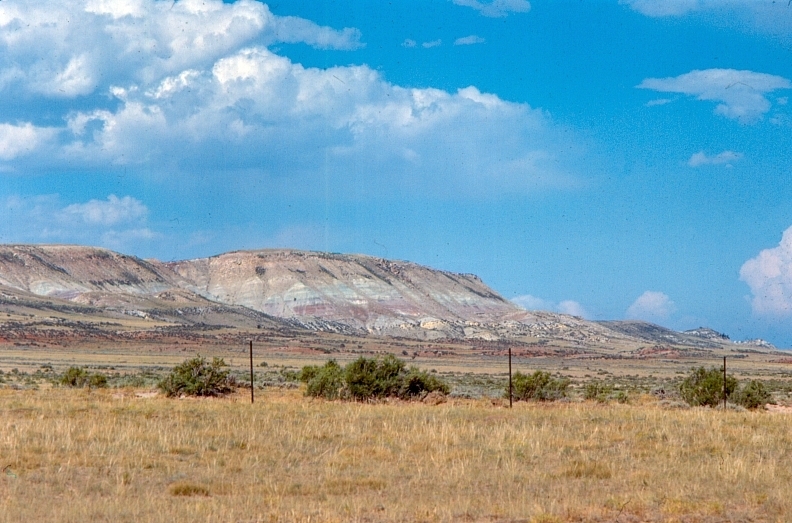 Past Kimball, we approach the Wyoming border and head toward the town of Pine Bluff.